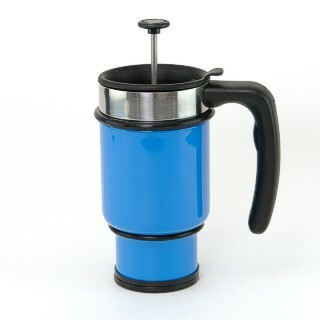 This useful commuter coffee press has a non-slip rubber base with a built in storage container to hold extra ground coffee for later use. It is designed particularly with the commuter and traveller in mind and should fit in the cup holder of most modern cars. For use when on the move, an additional one finger sliding non spill 'press & close' lid is provided. This cafetiere has a 0.4 litre capacity (just under ¾ of a pint) and is made from double skinned marine grade 18/8 stainless steel for thermal insulation, with a robust enamel coating. Available in seven attractive colours, cornflower blue, mango, iris, wasabi, pink, black and red. Incorporates a unique patented spring assisted plunger mechanism which prevents over infusing.